It’s impossible to think about Animaniacs without laughing at something, whether it’s the show’s memorable opening theme song, all of the wonderfully flawed plans of Pinky and the Brain to take over the world (by the way, definitely track down and watch the “John Brain” sketch in which Brain plots to take over the world by running for president. I promise you it’s very relevant today), or the show’s wonderful musical numbers of which there are too many to choose from (I had forgotten about their Macarena spoof until recently, and let me tell you, as a kid growing up in the 1990s, the Macarena was more viral than any meme you’ve ever seen), the show’s 99 episode run had so many great moments that it’s hard to choose from. Animaniacs made its debut on Fox Kids in 1993, created by Tom Ruegger and executive produced by Steven Spielberg. Yakko, Wakko and Dot were the main characters; they were Warner Bros. creations from the 1930s, trapped in the WB water tower in Burbank, California, until they escaped in the 1990s to coincide with the debut of the show. They were to then become the leads on a kids cartoon with a variety show vibe, and an irreverent sense of humor. 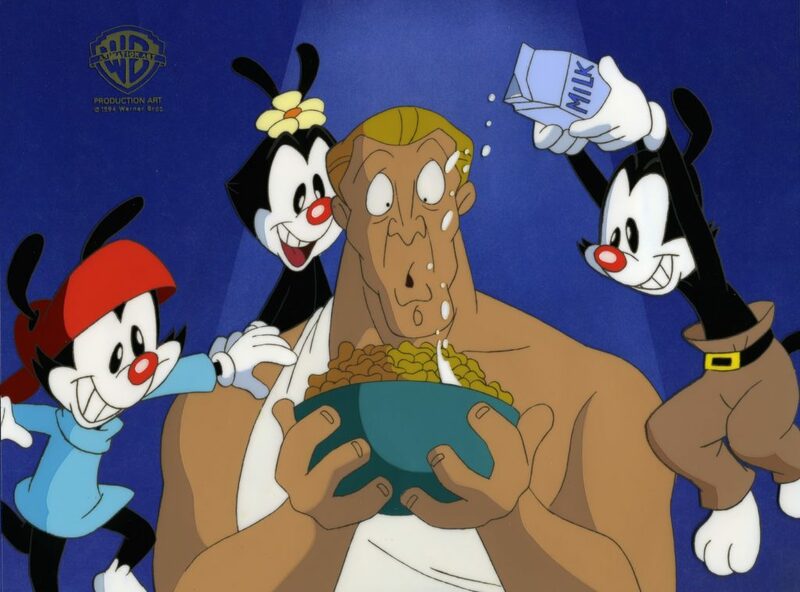 Among all of the things I remember about Animaniacs, that sharp sense of humor is probably the most relevant. It was a show for adults masquerading as a cartoon for kids. Sure, whether you understood everything or not, you knew growing up watching the show that there were plenty of references that flew over your head, and believe me, the writers on the show almost made it a competition to slip as many jokes past the censors as possible. But what’s so great revisiting Animaniacs all these years later is just realizing how smart the show was, in a way that it not only told great stories for kids to enjoy on a fundamental level, but was layered enough that upon rewatching the sketches many years later, you only start to realize how brilliant the series is. It was a show for adults masquerading as a cartoon for kids. The best example I have is the fourth episode of the series, which features one of my favorite sketches of the show called “Hooked on a Ceiling.” The premise of the sketch is pretty straightforward, if not wacky, so, basically, it was Animaniacs. Yakko, Wakko and Dot are expert ceiling painters (they don’t paint floors because it’s beneath them) who come upon famous Italian Renaissance painter Michelangelo, who is struggling to finish painting the ceiling of the Sistine Chapel. In the introduction of Michelangelo, the narrator of the sketch takes a shot at how cartoons have reduced actual pristine historic figures into a caricature of themselves, ironic in the fact that Animaniacs was not only doing that in this sketch by illustrating Michelangelo as a cartoon version of Kirk Douglas, but also because they spent plenty of time during the show’s run in parodying a lot of television shows and movies. “I’m afraid popular culture has successfully eradicated the actual identities of the true poets of art,” the narrator says in jest, as the Teenage Mutant Ninja Turtles, including Michelangelo, appear on screen. When Yakko, Wakko and Dot accidentally paint over Michelangelo’s work, the artist throws a fit. “You fools! I am the great Michelangelo and this is the Sistine Chapel,” he says, to which Yakko responds, “Oh yeah? If you’re so great, what happened to the other 15 chapels?” This kind of witty dialogue was standard for Animaniacs, but they were also very much in their element when they filled the scripts with cultural references. In one scene, Yakko says “Hey Mikey! He likes it”—which rewarded observant viewers who probably realized that it was actually a reference to a famous Quaker Oats Life cereal ad campaign which used a similar catchphrase. In another scene, Dot notes that Michelangelo prefers a younger Elvis to be painted. The writers were actually referring to a 1992 poll taken by the U.S. Postal Service asking the public to vote on which image of Elvis to use for a commemorative stamp. Later, when Michelangelo becomes frustrated, Yakko remarks, “This hasn’t happened to us since that Venus de Milo arms fiasco,” a riff on the actual Venus de Milo, which has no arms at all. There’s this secret headnod between the viewers and the writers, as if the show is saying to you: let’s see how many you can catch. This was what Animaniacs did. They rarely just threw a bunch of ideas at the wall. Sketches were written with wit, but the scripts were tight, and they often manage to tell a full story while squeezing the maximum amount of humor out of them. In fact, revisiting a sketch like “Hooked on a Ceiling,” I came away with another thought: how was this show ever on a kids channel? The genius of Animaniacs was a gift. While many animated series from that era have become dated, Animaniacs has simply gotten better with age. It reminds me of a YouTube comment about the show I once saw, where the commenter said you watched Animaniacs in three ways: as a kid when you pretended to get the cultural references, as someone a little older when you started to get some of the references, and as an adult when you died laughing at all the references. Animaniacs was ahead of its time. Its irreverent humor would fit in just fine with other animated shows of this era, that are cartoon in nature but with great pop-culture references. Some of the show’s most wicked one-liners and gag jokes, from two of my favorite segments—“Good Idea, Bad Idea” and “Wheel of Morality” (“Early to rise, and early to bed, makes a man healthy, but socially dead!”)—are like a collection of the most witty tweets that go viral today (I’m happy to admit I probably missed 70 percent of the references on the show growing up, but “2B or not 2B, that is the pencil” felt like the best joke ever when I saw the Animaniacs as a kid). Maybe a more dumb-it-down approach would have landed Animaniacs a larger audience at the time, but years later, it’s hard to find another show from that era with greater re-watch value. There’s a youthful exuberance about the sketches and the characters, but there’s also this secret headnod between the viewers and the writers, as if the show is saying to you: here are a bunch of jokes that we’ve embedded in the show, let’s see how many you can catch. It’s a fun game to play all these years later, and that’s probably the legacy of Animaniacs to me: the animated cartoon series that was established in an era ahead of its time, and continues to get better with age. The Hundreds X Animaniacs is now sold out in the Online Shop, but may still be available from a stockist near you. Check out the full list at the end of our lookbook post.